The settled weather continued up to the weekend, making for ideal conditions for Caenis fishing in the mornings, but the weather has turned more unsettled and breezy now, giving daytime fishers more chance of sport and making the Caenis fishing more difficult. Declan Gibbons reports on a week of early starts and some superb fishing for those early risers. Larry McCarthy of Corrib View Lodge Glencorrib (www.corribangling.com) says it was another very busy week at the lodge, with lots of good Caenis action. Owein Mealing and Nick Measham from the UK enjoyed four great early mornings with Larry, catching 30 trout which were all sportingly returned. Four of the fish weighed in excess of 4lbs. Jim McEvoy, a regular client from Cork, had 3 brilliant mornings with Larry and he caught 17 trout for 42lbs, all returned to fight another day. The weather change has made the fishing more difficult but with a little knowledge trout can be found in several areas of the lough feeding on Caenis. Anglers staying at Corrib View recorded 72 trout for the week. In the Oughterard area Tom Kelly reports on the John Gill Cup competition which was held on Sunday last and saw 23 rods participate, with Jim Glynn winning the competition with 2 fish for 4.13lbs. Second place went to Mark Colton with one trout weighing 2.15lbs and in third place was John Kelly with one fish for 1.95Llbs. 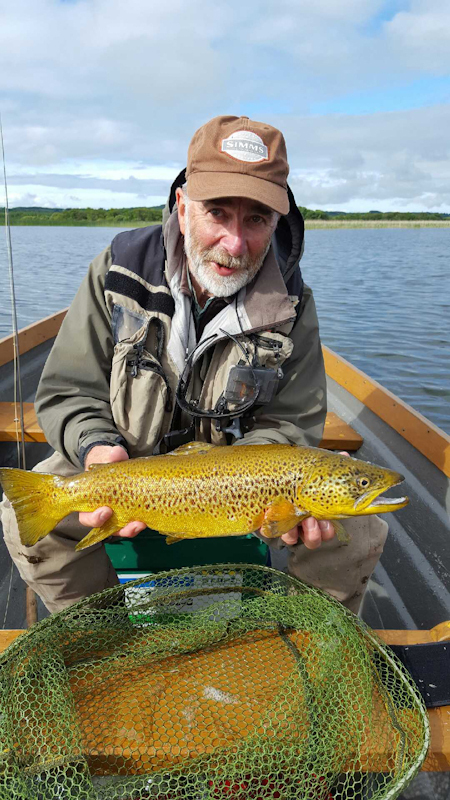 Visiting Swiss angler Stefan Kaufmann staying at Currarevagh House has enjoyed some excellent fishing on Lough Corrib dapping and trolling. He had one cracking fish for 9.25lbs among many others landed. 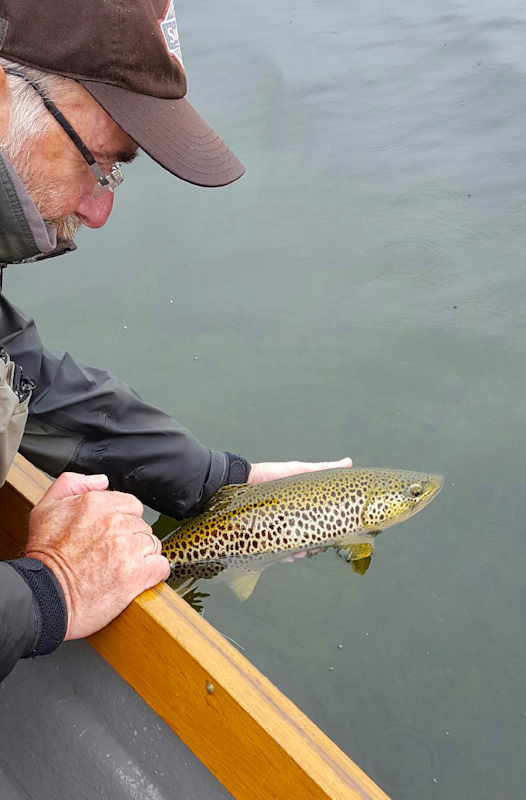 Galway angler Harold O'Toole enjoyed catching 3 trout on Saturday morning last all on Caenis (best fish 4lbs) and on Sunday Harold boated fellow Galway angler John Reidy who caught 5 trout, also on Caenis, with the best fish being 3lbs. Basil Shields reports on quieter fishing activity for the week gone by with only one angler producing the goods on early morning Caenis fishing - John Crookshanks from Northern Ireland landing 9 trout for one morning, with the best fish being 3lbs. Jim McEvoy Cork releasing one of his 17 trout taken on Caenis on Corrib in the early morning. James Quinn reports another good week in Galway, with perfect water levels at one gate open and a great run of grilse through the fishery giving anglers great sport, in spite of high water temperatures which reached 21 degrees C. There were 65 fish recorded for the week, with a huge number of fish also hooked and lost. Only 16 were taken on shrimp, with the rest on fly. Louis Brennan, Tuam had 2 fish on shrimp at 3.5 and 5.5lbs. Some Northern Ireland anglers had good sport for their visit, with Ben Gilbert landing 2 for 3 and 4lbs, Ian Jefferson taking a 4lbs fish, and Jim Davison and Andrew Lynas also landing a 4lbs grilse each. John Anderson, Moycullen had 2 grilse to 5lbs, while Billy Millar (NI) had 2 grilse of 3 and 3.5lbs on fly. Dublin angler Dave O'Reilly landed 2 fish for 4.5lbs each on fly, PJ O'Connor also had 2 fish of 4 and 4.5lbs on fly, while expert fly man Mossy Brown from Waterford landed 2 fish to 4lbs on fly. Water levels are perfect for angling at the moment, and grilse are running in good numbers on every tide, making for excellent fishing prospects for the week ahead. Fishery manager Terry Gallagher reports on fishing over the last couple of weeks from Costello. As with a lot of fisheries in the west Costello has seen little rain and plenty of sunshine in the last weeks. Understandably rod pressure was low as a result. That being said, fish can also be caught in low water conditions as the following intrepid anglers demonstrated recently. Paraic McDonagh wrestled a 5lbs bar of silver from the sea pools towards the end of May. Richard and Hugh McGuire were not deterred either and were rewarded with 2 grilse of 5lbs and 3lbs, after travelling down from Dublin. Neil Spellacy's first visit to Casla in 2016 was certainly successful as he landed a 4lbs silver grilse on River Beat 1. Finally, grilse of 4lbs 12oz and 4lbs 4oz fell to the Black shrimp when Geoffrey Fitzjohn also fished River Beat 1. The more unsettled weather this week and a drop of rain should help sport at Costello and get salmon and sea trout moving into the system. To book fishing, give Terry a call at 087 2399988. Fishery manager Osgur Grieve reports that after an unusually long period without rain here in the west we have had a small rise in water levels over the past few days. The river was low at 0.52m on the 9th, but Bill Middleton persevered accompanied by his two friends Ben and Robin. Bill was successful catching a 4.5lbs grilse from the Falls Pool on a small Stoat's Tail; the fish was very fresh and had come in despite the low water conditions. 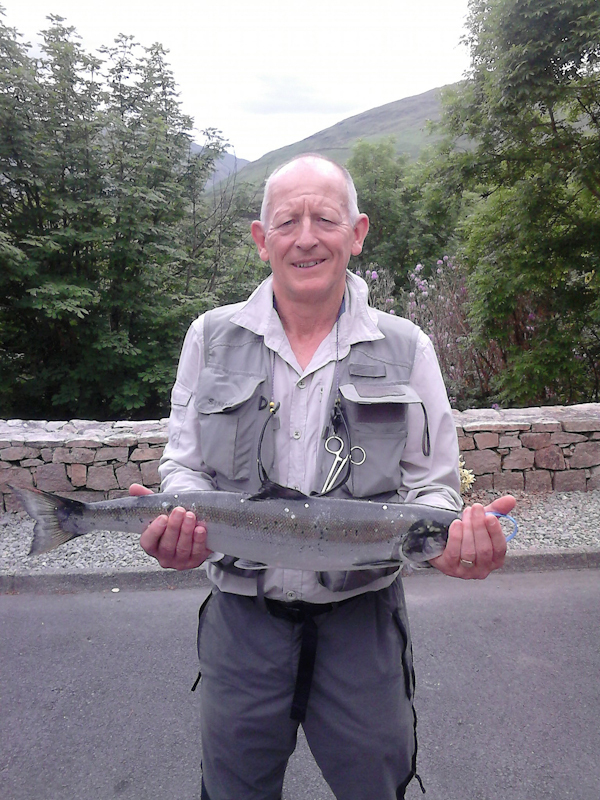 Erriff Angling Club fished on Sunday and Brian Graham was successful, landing a 3.25lbs grilse on a Black Shrimp fly. The river is up to 1.16m at the time of writing so hopefully this rise will encourage some more fresh fish to come in. Salmon and sea trout were clearly visible at the falls yesterday trying to continue their journey upstream.